During the war years we had chickens, rabbits and goats. We didn’t have electricity in the house when we first moved in – we had water but nothing else – nor were the roads made up. Roedean and St. Dunstan’s were both taken over by the Navy in the war – There was barbed wire all along the coast line – you couldn’t get down to the beach at all. The only place you could swim was Seaford – I used to cycle over there with my cousin for a swim. In the war we had two guns and a big ack-ack and a searchlight on the top here in Longhill Road. We had 18 incendiaries on our back lawn and we had a big bomb case dropped at the back. Also a house over the road was bombed. We had the chickens, goats and geese and rabbits, we grew a lot of vegetables in the garden. Well it was that ‘Dig for Victory’ thing – we had to do it – but it was hard work sometimes. The rabbits were awful – they were terrible to clear out – they were very smelly. We had all the front of our house sand bagged up to protect it. My father was the warden here together with Mr. Harwood who lived opposite – we had the telephone here with the siren on the roof. The house shook when the siren went off. In the war I used to go to the canteen in Rottingdean where the car showroom is now – the motor place in the High Street. I used to go with a girl called Ivy Fox – and I then had to walk back across the hills at night. I remember seeing the cows up there and I regularly fell over. Of course even apart from the blackout, there were no street lights in the village at all so you can imagine what it was like trying to find your way home. We did have one or two doodle bugs – I remember being in the back bedroom with mother and hearing them going over and saying ‘Oh my God I hope it’s not going to stop’. 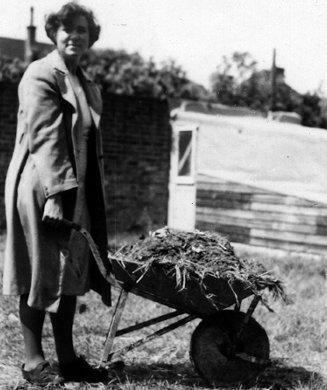 During the war I worked in Lewes and we were asked to work as Land Girls – I remember hoeing turnips above Heathfield – and that was the doodle bug run. We would hear them and have to lie flat on our backs if they went over. You could hear them coming and also see them going over – it was very frightening – but then you got used to it – I suppose it was a case of having to really.